Burma’s main opposition party is fielding ethnic candidates in their native states in an effort to ensure success outside the Burman-majority heartlands. RANGOON — Until a few months ago, Mi Kon Chan was running a company that distributes skincare and other cosmetic products imported from Australia, Italy and Switzerland. But since Tuesday, the ethnic Mon woman has been on the campaign trail in Paung Township in Mon State, where she will contest the upcoming election on the ticket of Burma’s main opposition party, the National League for Democracy (NLD). Mi Kon Chan is just one of many ethnic NLD candidates who will contest in their respective native regions. Although the exact number is not yet available, at least 40 percent of the party’s total 1,127 candidates standing in the November poll are thought to be ethnic persons. According to Win Myint, one of the party’s central executive committee members, around 80 percent of those running in constituencies in Burma’s seven ethnic states are ethnic candidates. “The majority of our ethnic candidates come from where they [are running]. For example, we have Shan candidates for Shan State and the same in Mon,” Win Myint told The Irrawaddy. Of the 92 political parties registered with the Union Election Commission, 55 are ethnic parties that will mostly compete in their respective strongholds across the country’s seven ethnic states. But they will face stiff competition from the NLD, which is evidently endeavoring to shed its traditional image as a party synonymous with the country’s ethnic Burman majority. “The NLD is not a Burman party but a political party that represents all ethnic people in Burma,” said Nawng Na Ja Tang, a 60-year-old ethnic Kachin candidate running for the party in Kachin State’s Tanai Township. The loyal member, who first joined the NLD in 1989, said he has supported the party through the years because he likes its stance on ethnic rights and federalism. “The NLD have been sticking to these issues since 1990 until now. If the party wins and can form the government to make changes, I believe we will have peace,” he said, pointing out that there has been recurrent fighting between government troops and local rebels in Kachin State for decades. Many other ethnic people like Nawng Na Ja Tang, who desperately want to see changes—economic, social and political—in their respective states, applied for NLD candidacy when the party announced nearly three months ago that it would also welcome applicants from outside its membership. Personally picked up by Aung San Suu Kyi, Mi Kon Chan said deciding whether to compete in the Nov. 8 election was probably “one of the most difficult decisions” she has ever made. Born into an ethnic Mon family, she has been a long-time supporter of Suu Kyi and her party. Mi Kon Chan’s father, Nai Thet Lwin, is one of Suu Kyi’s old political allies and now the vice-chairman of the Mon National Party that put forward 55 candidates to stand in the coming poll. “My dad doesn’t have extreme points of view, though he has always put the affairs of his people first. We didn’t have any problems and he didn’t complain about my NLD candidacy,” she said. “[The status and rights] of ethnic people will only be better when the country has prospered and developed. We have to do for the good of the country first, and then the rest will follow. Whichever side we [my dad and I] are on, we are on the same road,” the ethnic Mon woman explained. 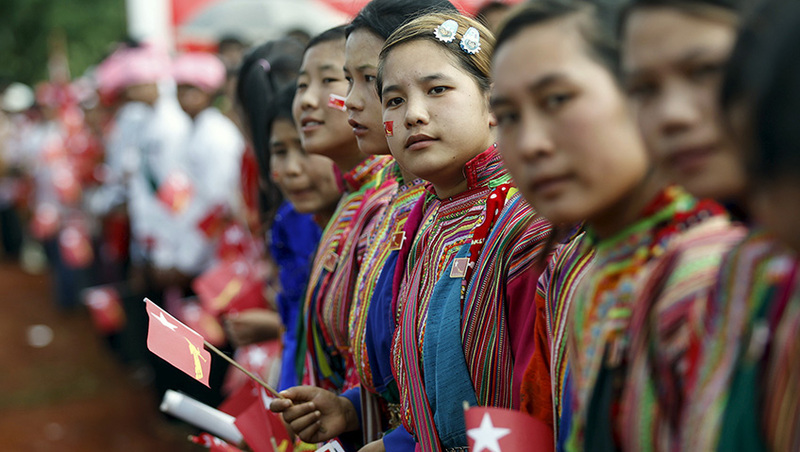 Ethnic Lisu women wait for the arrival of Aung San Suu Kyi in Hsiseng Township in Shan state, September 5, 2015. The NLD’s nationwide presence in this year’s vote mirrors its political efforts in the 1990 election, 25 years ago. In the 1990 poll—the results of which were not recognized by the then ruling junta—the NLD won 71 percent of seats in Karen State, 73 percent in Kachin State, 80 percent in Mon State and 50 percent in Karenni State. In Shan, Arakan and Chin states, it won 39, 34 and 30 percent, respectively. However, the party has come under fire in recent years, including from human rights and ethnic activists, for failing to speak out against conflict and injustice in ethnic areas, particularly the ongoing fighting between the Burma Army and the Kachin Independence Army in the country’s north. Such pushback has prompted speculation that Suu Kyi’s party would not enjoy the level of success it might have anticipated in ethnic areas. However, the NLD’s strategy of fielding ethnic candidates in their native states may yet pay off at the polls. Aung Kyaw Naing is an ethnic Intha, a group traditionally from the Inle Lake area, who decided to contest for the NLD in Shan State, ahead of the various other ethnic parties competing in Burma’s biggest state. He said that even if ethnic parties win, they could not muster the required seats to form a government and to bring changes to the country. For this reason, he was competing for the NLD. “We need to have a strong government. Given the current situation, the NLD is the strongest opposition,” he said. Top Photo - (Soe Zeya Tun / Reuters) A woman of the Yin Net ethnic group gifts a traditional cloth to Aung San Suu Kyi as she delivers a speech on voter education in Hopong Township, Shan State, September 6, 2015.